Turkish President Recep Tayyip Erdo?an on Thursday (26 November) dismissed “emotional” and “unfitting” suggestions that projects with Russia could be cancelled following Turkey’s downing of a Russian warplane near the Syrian border. In an escalating war of words, he responded to Russian accusations that Turkey has been buying oil and gas from Islamic State in Syria by accusing Syrian President Bashar al-Assad and his backers, which include Moscow, of being the real source of the group’s financial and military power. The downing of the jet on Tuesday (24 November) was one of the most serious publicly acknowledged clashes between a NATO member and Russia for half a century, and further complicated international efforts to battle Islamic State militants in Syria. Russian Prime Minister Dmitry Medvedev ordered his government yesterday to draw up measures that would include freezing some joint investment projects and restricting food imports from Turkey. Russia’s Economic Development Minister Alexei Ulyukayev stated that the Turkish Stream gas pipeline project falls under the restrictive measures against Turkey. The restrictions against Ankara may also include the Akkuyu Nuclear Power Plant, which is currently under construction in the Turkish province of Mersin, Alexey Ulyukayev said. Russian restrictive measures against Turkey reportedly will also include tourism and Turkish food imports to Russia. “Joint projects may be halted, ties could be cut’? 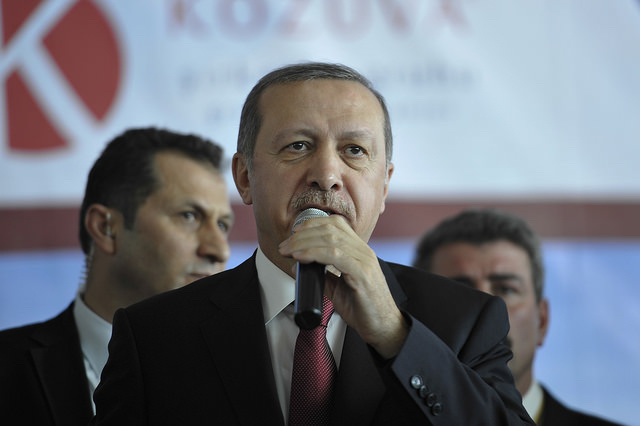 Are such approaches fitting for politicians,” Erdo?an questioned in a speech to local officials in the capital Ankara. Erdo?an said the Russian jet was shot down as an “automatic reaction” to the violation of Turkish air space, in line with standing instructions given to the military. Russia insists its jet never left Syrian airspace. On Wednesday, Medvedev alleged that Turkish officials were benefiting from Islamic State oil sales, while Russian Foreign Minister Sergei Lavrov said it was no secret that “terrorists” use Turkish territory. “Shame on you. It’s clear where Turkey buys its oil and gas … Those who claim we are buying oil from Daesh like this must prove their claims. Nobody can slander this country,” Erdo?an said, using an Arabic acronym for Islamic State. In an op-ed published by The Times on Thursday, Turkish Prime Minister Ahmet Davuto?lu choses a more diplomatic language to address the need to defuse tensions following the downing of the Russian jet. Davuto?lu calls the jet “unidentified” in an attempt to counter Russian positions that this had been a planned act. “The downing of an unidentified jet in Turkish airspace was not – and is not – an act against a specific country. Turkey took action, based on standing rules of engagement, to protect the integrity of its sovereign territory. The necessary discussions are now taking place. While the measures to defend our territory will remain in place, Turkey will work with Russia and our allies to calm tensions,” Davuto?lu writes. He also appeals for a broad coalition against Islamic State. “We must not be distracted from the cause that unites us […] This is the time to stand firm against Daesh. Collective action that harnesses the varying strengths of the US, the EU, Russia, Turkey and others can, and will, turn the tide”, he writes. It’s already been estblished that this must have been a preconceived plan waiting for an opportunity. So what does Erdogan expect, a medal or something? I will only say Turks are not trustworthy and should be expelled from NATO and closed out from future EU membership. They are warriors of ISLAM. Junckers new best mate strikes again, they will make the prefect replacement in the EU when the British people leave.